With the Remarkables looking on, the TSS Earnslaw plies the cool waters of Lake Wakatipu between Queenstown and Walter Peak High Country Farm a journey lasting 90 minutes. Commissioned on October 18, 1912 at one time she used to carry a cargo of sheep, but today the TSS Earnslaw is a major tourist attraction, hence her new cargo is human. T.S.S. 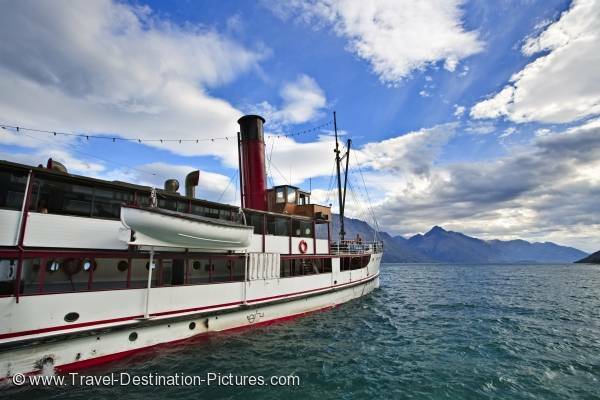 Earnslaw on Lake Wakatipu, Queenstown, Central Otago, South Island, New Zealand. Lake Wakatipu after departing Queenstown in Central Otago.